After a delightful dinner last night with family and friends, we had a wonderful (and full!) day in Paris. We started making sure everyone was up around 8:30, even though some of the children were up much earlier than that. We all had breakfast together in the lobby of the hotel and left the hotel at around 10am to begin our day. We walked from our hotel near Montparnasse through the Jardin du Luxembourg to the Musée du Cluny, the museum specializing in the Middle Ages. The children all had an audio guide for kids, and they all followed along, very interested. The museum is most famous for the six tapestries known as The Lady with the Unicorn. We saw sculptures, stained glass windows, a chapel, many religious artifacts, paintings, tapestries, and jewelry from the Middle Ages. By the time we had finished with the visit and bought some souvenirs in the gift shop, it was time to eat lunch. We walked around the Latin Quarter until we found a crêperie with enough room for our group. The children were once again ecstatic to have crêpes. For dessert, all but one of our eleven students had a crêpe with nutella. During dessert, you could have heard a pin drop. They were all as quiet as mice as they ate their delicious sweet crêpes. After lunch, we walked over the Seine past Notre Dame to meet our guide at the Place de l'Hôtel de Ville for our "rallye médieval" or medieval hunt. Our guide, Cyril, was captivating. For the whole two hours, even with the cold wind blowing, the children listened attentively, participated, and asked excellent questions. Cyril was full of "histoires horribles" that the children loved. He explained how this square was where merchants used to gather. It was also the place where people who had committed crimes were punished. He explained the punishment for each crime and taught the children the word 'régicide' or the act of killing the king (or attempting to.) This particular crime only happened twice and was punished by quartering. Our hunt took us all around the oldest part of Paris surrounding and on l'Ile de la Cité. The children had a worksheet with several quiz questions and things to find. Each time Cyril would ask them to respond to a certain question, whoever found it and came back first won a point for his/her team. The teams were boys against girls, and the girls won by one point, although they all did a great job participating. We were all cold after our two hour hunt with Cyril, but we were still satisfied at having learned a lot. Even the adults commented that they had learned a lot. How wonderful to learn in such a fun way! 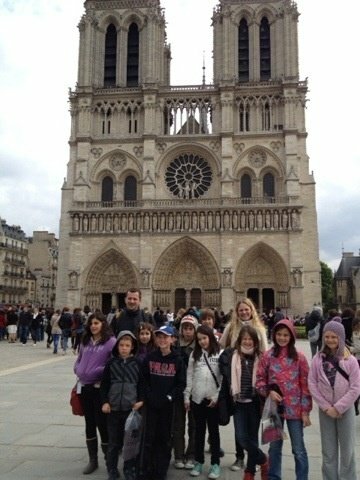 The children were anxious to do some souvenir shopping after the visit, so we visited a few of the souvenir shops next to Notre Dame. Everyone was able to find some souvenirs to bring home. We then walked to the métro at Châtelet. It seemed like we had to walk underground forever to get to the RER, but at least we were sheltered from the wind. We took the RER to the Opéra Garnier. What a site to come out of the métro station to this beautiful building! We went to the Grand Hôtel de Paris where we were warmly welcomed by Manon's godmother, Paz Blasco de Lafuente, the VIP Manager of The Grand Hôtel Intercontinental. She gave us a wonderful tour and explained that the hotel is about to celebrate its 150th anniversary. She showed us a small ballroom that lead into the grand ballroom. When she opened the door, it was met with many "Wows!" It really was a wow factor room. 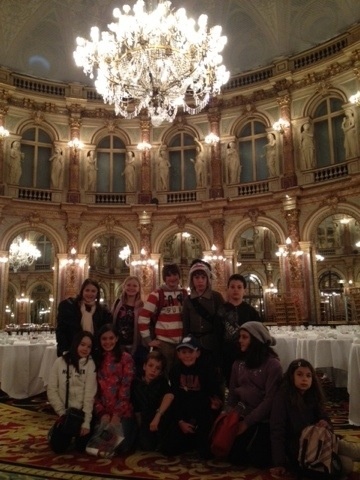 We took a photo the group in the grand ballroom (see below). We also saw the Café de la Paix that is attached to the hotel and is classified as an historic monument of Paris. After the visit, she brought us to the Club Intercontinental where we enjoyed delicious pastries, hot chocolate, and other drinks while relaxing on red velvet sofas. We had a view of the roof of the Opéra Garnier from the Club, and we really felt spoiled! Paz even provided a gift of a pen and awesome keychain for each of us to remember our special visit to the Grand Hotel Intercontinental. After thanking Paz for a wonderful visit, we walked to Place de la Madeleine to meet our bus for the visit of Paris. We were met there by Olivier's sister and niece who joined us for our visit of Paris by bus. It lasted about 90 minutes, and the children took many pictures. It finished as the sun was setting. We were able to get three taxis back to the hotel, and I noticed that even though it was close to 9pm, the sky was still not fully dark. Upon arriving at the hotel, the children were instructed to pack everything but their pjs and clothes for tomorrow. We then met in the lobby for a quick bite before heading to bed. It will be an early morning as we leave for the airport at 7:15am. It's hard to believe that tomorrow we'll be back in California.